Oral B 7000 vs 8000 Electric Toothbrush: Does the Difference Justify the Extra Cost? To make your search a bit clearer, here is a side by side comparative analysis of the Oral B 7000 vs 8000 model also called the Oral B Genius 8000.These two smart brushes utilize Bluetooth tech to sync up with smartphones and can store data on your brushing habits. But which is best? As in the battle between Oral B vs Sonicare; you are bound to meet so many models and options that can be confusing to sift through.This is especially true for Oral B products. The choices are simply overwhelming. Take for instance the Oral B 8000 vs 7000 electric toothbrush below which look more or less similar at a casual glance. The 8000 is good at focusing on a comprehensive clean thanks to the Criss-Cross bristles. offers Position Detection which will tell where you're brushing and when to move on to a different section. The 7000 focuses more on plaque removal . The 7000 comes with four replacement brushes. As you may have already guessed, the 7000 and the 8000 models both come from the Oral-B Pro line. They are more high tech than other non-Bluetooth models, although that is becoming increasingly common. Still, the brushes are deserving of the Pro label, as they have numerous features (and brushing settings) that set them apart from other basic brushes out there. READ Oral-B Genius Pro 8000 vs Philips Sonicare Diamondclean? Which one is Better and Why? The 7000 and 8000 were both designed to give users a lot of specialized options for brushing. The handles are standard design and the brushes themselves come in a selection of black or white. Both brushes have a Pressure Ring to alert you when you are brushing too hard. They are pretty identically designed overall, but nothing fancy unless you count being able to change the pressure ring light on the 8000 to 12 colors. The 7000 focuses more on plaque removal while the 8000 is good at focusing on a comprehensive clean thanks to the Criss-Cross bristles. The 7000 comes in two colours : black and white . The 8000 does offer a thorough cleaning around the gum line safely, as does the 7000 to some extent. However, the 7000 does have great instant feedback on how you’re brushing in real time thanks to its Smart Guide. The 8000 comes with three replacement brushes while the 7000 comes with four. The 8000, by contrast, offers Position Detection which will tell where you’re brushing and when to move on to a different section. The 7000 comes with a wireless smart guide that the 8000 doesn’t have. You can shift through settings on a button near the power icon for the 7000 while the 8000 has symbols for its six settings. The 8000 has a phone holder which the 7000 doesn’t. The 8000 has a cool feature where you can flash one of twelve different LED Smart Ring colors using the app and is also said to have better feedback when it comes to your brushing habits and tracking what you do. It also comes with a Smartphone Holder, so the 8000 can also charge your brush in the case and hold your phone and charge it at the same time. It also removes 500% more plaque than the 7000. At the end of the day, the 8000 does perform better at battery than the 7000. It can last for twelve days as opposed to about 10 for the Pro 7000 model on the same charge with regular use. However, as a brusher that might not be particularly what you’re looking for. If you’re in it for the best brush possible, you’re going to have a great option in the Oral-B Pro 7000 or 8000. 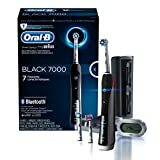 The 8000 is slightly more advanced than the 7000 and the edge on more features is what might give it the advantage over the 7000 as it has good pressure sensing and focuses on cleaning each tooth as effectively as possible for an overall cleaning experience that is superior to many other models outside the Oral-B Pro line. Both models are worth a look. If you want a sophisticated electric toothbrush that works with your phone and has Bluetooth, you can’t go wrong with the 7000. However, if you want slightly more and don’t really care about plaque removal, the 8000 might just be the one you want. It also has a comfortable handle, comes with a traveling case and smartphone holder, and has the longest battery life. 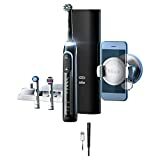 If you already have a 7000 model it’s not worth the upgrade but if you are buying something new, want a lot of settings, neat accessories, have Bluetooth, and offer a great clean, check out the Oral-B Pro 8000 Electric Toothbrush.